Dave grew up in Westboro, MA, a town in between Worcester and Boston. Part of an Irish-Catholic family, he was the middle of five kids and has every kind of sibling you can have except a twin: older brother, older sister, younger brother, younger sister. The McGraths loved the Bruins and Red Sox, and Dave grew up playing baseball, pond and street hockey. He prided myself on being tough, and when he was in 3rd grade he walked around all day on an ankle he had broken at recess (really smart to be tough). When Dave was 14, after experiencing painful and embarrassing symptoms for years, he was diagnosed with Crohn’s Disease and the doctors took a foot and half of his intestines out. He learned to live with his new condition, and a few years later starting having different symptoms (headaches and double vision). Unlike with his Crohn’s, he went to the doctor right away and within a week was diagnosed with a cancerous brain tumor...good thing he didn’t wait! Dave started treatment right away and has been cancer free for over 20 years! 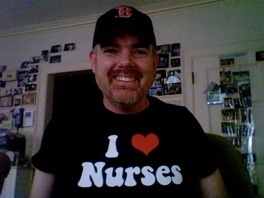 After working as a special ed teacher for 10 years, Dave started working at the American Cancer Society’s Hope Lodge in Worcester, MA. Hope Lodge gives free rooms to cancer patients who are in the middle of treatment. 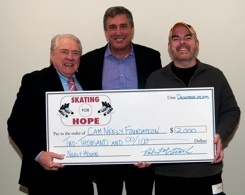 In 2011, Dave started a non-profit called Skating for Hope, which is a skating and hockey event that benefits cancer patients who are in the middle of treatment. Dave also started volunteering as a speaker for the cancer awareness group 15-40.org. In late 2016, The American Cancer Society announced their decision to close the Worcester Hope Lodge. Although this upset Dave a lot, it helped him come up with a plan to travel through all 48-mainland states to see the country, share his story, and perform standup comedy - a feat he completed in just 2 months!